You know that day that you can't get the idea of fudgy delicious super-chocately brownies out of your head? Well, that was me, yesterday. I guess it was a week of honey cake and other dairy-free desserts, but whatever... I had to make BROWNIES. Now, I know that a lot of you, dear readers, look to my blog for the convenience of not having to sift through dozens of recipes to find the best ones. 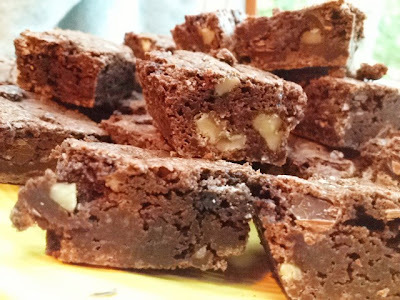 Well, here is the definitive brownie recipe, thanks to Ina Garten, who we know, never holds back on the crucial ingredients-- in this case, butter and chocolate. I have tweaked it a tiny bit, using espresso powder instead of instant coffee, increasing the salt a bit, and exchanging pecans for walnuts. So give it a try and let me know what you think. Preheat oven to 350°F. Butter and flour a 12x18x1 inch baking sheet. Melt together the butter, one pound of the chips, and the unsweetened chocolate in a medium bowl over simmering water. Allow to cool slightly. In a large bowl, stir (do not beat) together the eggs, coffee granules, vanilla, and sugar. Stir the warm chocolate mixture into the egg mixture and allow to cool to room temperature. In a medium bowl, sift together 1 cup of flour, the baking powder, and salt. Add to the cooled chocolate mixture. Toss the nuts and 12 ounces of chips in a medium bowl with 1/4 cup flour, then add them to the chocolate batter. Pour into the baking sheet. Bake for 20 minutes, then rap the baking sheet against the oven shelf to force the air to escape from between the pan and dough. Bake for another 15 minutes, until a toothpick comes out clean. Do not overbake! Allow to cool thoroughly, refrigerate, and cut into squares. Ina’s notes: Flouring the chips and walnuts keeps them from sinking to the bottom. It is very important to allow the batter to cool well before adding the chips, or the chips will melt and ruin the brownies. Do ahead: This recipe can be baked up to a week in advance, wrapped in plastic, and refrigerated.